"The first priorities are to bring the existing anti-censorship groups and activists together." "Let life on the blog unfold like off-blog life... What undermines my trust is [the] impulse to control. Those who want such things worry me as much as a candidate with too little body fat." "Mainland media authorities have marked out 20 forbidden areas in an attempt to promote a "harmonious" atmosphere for upcoming national and party conferences." "His new startup is an Internet business consulting company called Five Seasons." Congratulations Keso! 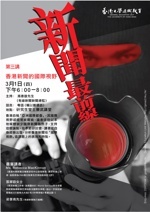 I somehow agreed to be on a panel tomorrow called News Uncovered, discussing how the Hong Kong media covers (or doesn't cover) international news. 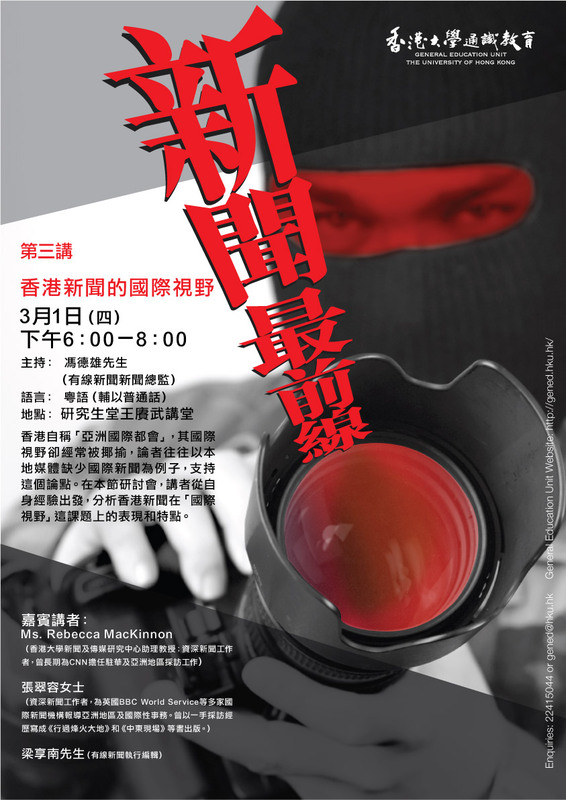 All the other panelists will be speaking Cantonese, except yours truly, who will be speaking in Mandarin. If you live in Hong Kong and know one of those languages and feel like coming to make fun of my street Mandarin and rusty vocab, feel free. It would also be great to have some folks asking provocative questions. You may be wondering: I just showed up in Hong Kong. How am I qualified to speak about the quality of the Hong Kong media's international news coverage? When I asked that very question to the organizers, they replied that they wanted me to be the person who brings a more international perspective to the debate and ties the discussion to the issue of global news coverage in other countries. Other than that I'll stick to my usual themes: issues of global news and attention imbalances, the rise of international blogging as an alternative source of international story-telling, and the debate amongst U.S. newsies and media pundits over the future (or end?) of "foreign correspondence. " More of my recent rantings by me here and here, plus a couple new articles on the demise of the "foreign correspondent" - both very worth reading - in the Washington Post and on the website of the Committee of Concerned Journalists. I expect to learn quite a lot from the other panelists and hopefully from the audience about what journalism schools like the JMSC might be able to do to encourage better international reporting by Hong Kong's media. "China will "win". I just wonder what that "winning" is ultimately worth. " Originally uploaded by Isaac Mao. 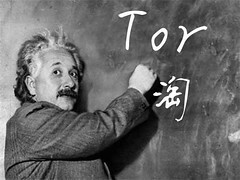 Isaac Mao posted this great mashup to his Flickr stream last summer, reflecting the enthusiasm of many Chinese Internet users for Tor. On Sunday some people began to worry that people may have been putting too much faith in Tor after somebody posted on Slashdot about a technical paper (PDF) that lays out an attack against Tor - in other words exposing one of its vulnerabilities that might enable an attacker to trace a user through the network. The UColorado/Boulder technical paper is an example of the evolving research in anonymity. Refining well-known attacks from several years ago, the researchers better documented what an attack on the network might look and behave like. They combined a bandwidth overstatement attack with a correlation attack. They consulted with us on the project. We are aware of these kinds of potential attacks — but such a bandwidth overstatement attack, to be successful, would leave fingerprints all over the Tor directories. We have never seen such an attack “in the wild,” and we think it no more likely that this paper would make such an attack easier or more likely than it was a few years ago when another version of it was documented. Q0. Most importantly, does this attack mean that we should stop using Tor? A0. ABSOLUTELY NOT! Despite our findings, Tor is the most secure and usable privacy enhancing system available. We believe that the system is safe for end-users; however, the system is experimental and the developers make no guarantees about the degree of privacy that it can provide. Let us re-iterate: Concerned users should NOT stop using Tor. For the short-term, the maintainers of the Tor directory servers can monitor the router list to ensure that there are no anomalous advertisements, and blacklist any suspicious routers. In our paper, we point out several counter-measures that significantly reduce the attack's effectiveness by increasing the resources required by an attacker to mount the attack. We appreciate that people care about Tor. If in the future you are worried about some issue in Tor, please feel free to contact us directly. If you read speculation about Tor, please encourage the bloggers to check with us — we’re very blogger friendly, and part of our purpose is to protect bloggers where blogging isn’t safe. Imagine this scenario — a very small risk documented in a technical paper gets sensationalized in the blogosphere. Some number of dissidents and bloggers in places such as China abandon Tor. As a result, they might be arrested, jailed, or disappeared. Blogstorms can have real world consequences. Please ponder before you write, critically examine what you read, and ask us for updates. If you're interested in learning more about all this stuff, one of the smartest writers about Internet "hacktivism" is my friend and former colleague Ethan Zuckerman. Check out his guide to anonymous blogging with Wordpress and Tor; thoughts on how cyber-activists should approach privacy and circumvention "threat models", and evaluation of Psiphon, another tool that takes a different approach to circumvention, and comparison with Tor. Click here for slides of a workshop Ethan did with security expert/ "hactivist" Nart Villeneuve on how to use Tor and other circumvention and privacy tools. "at least for now, Blinkx leads video search: it searches more than seven million hours of video and is the largest repository of digital video on the Web." "In this post I hope to give a cross section on how life is for Iraqis in a world of violence and general insecurity." Dan Gillmor calls for "a broad rethinking of journalism education itself." Global Voices Online » China: Disgraced Party member promoted? "One of the most blogged-about political scandals of 2006, it was given fresh momentum with the news last week of Lan Qinghua’s appointment as Deputy Director of the Statistics Bureau for Chongqing Municipality.."
"It should be huge news when two of our European allies demand the arrest of U.S. government agents — but these stories were rapidly superseded on the front pages by news of Anna Nicole Smith..."
"European capitals are wavering over how to approach the final two years of a US administration saddled with inconclusive wars." Gen Kanai weblog: digg on Japanese "racism"
"Digg may be worse than Slashdot for commentary. It's a trainwreck reading this stuff." Mark Glaser ask for your suggestions: "perhaps together we can come up with a list of ways in which newspapers can enter this new age while retaining their goodness"
"Try this on as a new rule for newspapers: Cover what you do best. Link to the rest." Sun Bin's conclusion upon visiting Hong Kong's cyberport: "So much for HK's cyber dream." "Today, Americans' need to understand the struggles of distant peoples is greater than ever." "If the past is prologue, we're seeing the tip of a very large iceberg." The South China Morning Post has a front page article today - which I can't link to because it's only available to paying subscribers - headlined "Golfer sues over Wikipedia entry." It is a compilation from several sources including the Associated Press. One version of the AP story is on PGA.com, titled Zoeller sues to identify the author of a disputed entry on Wikipedia. 1. How long was the libelous information on the front of the Zoeller wikipedia page before it was taken off? 3. Apparently this information was picked up by some other websites but nobody specifies what they were. What kinds of sites were they? Sites belonging to news organizations? Chatrooms? Blogs? Does anybody out there know the answers? If so please post them in my comments section. One other interesting thing: the news stories all mention that the offending information was removed from Zoeller's Wikipedia page. Here some stuff they didn't mention: Normally when something gets removed from Wikipedia it can still be found in the page's history section which documents all changes ever made to it. However according to the discussion page for the Zoeller entry, the offending material has been removed by administrators even from the history page. If you scroll down that discussion page you'll see that one wikipedian has responded to somebody's question about whether it was correct to do so: "It makes no sense to make these revision available. Maintaining them would be asking for Wikipedia to be sued. The libel text can be viewed in the lawsuit." Wikipedia's entries are not exactly prices, but they do aggregate the widely dispersed information of countless volunteer writers and editors. In this respect, Wikipedia is merely one of many experiments in aggregating knowledge and creativity, that have been made possible by new technologies. The good and bad of Wikipedia is not dissimilar to the good and bad of stock prices: "No less than stock prices, prediction markets may be subject to manipulation." He also believes "we're seeing the tip of a very large iceberg." Might it be instructive to look at how markets evolved from the early days of capitalism to get a sense of how to prevent abuses in the new and emerging "market of information" that Wikipedia represents? As it so happens, my class has just been learning about wikis and Wikipedia. (In addition to the obligatory assignment to edit a Wikipedia entry themselves, and observe the relevant "history" and "talk" pages, readings include the recent New Yorker piece on Wikipedia, a NYT story about how courts use Wikipedia, and Andy Carvin's recent post about Middlebury College's ban on the use of Wikipedia as a source in papers. I also showed them Steve Colbert's recent hilarious comedy routine on "Wikilobbying." ) This ongoing case will be great fodder for student blogs and student-led discussions about their assignment and the readings this coming week. "The Egyptian government today for the first time sentenced a blogger to prison for his writings, threatening a window of free speech that has emerged on the Internet, Human Rights Watch said today." "An Egyptian court has sentenced a blogger to four years' prison for insulting Islam and the president." "Despite a support site, petitions and demonstrations in Bahrain, London, Stockholm, Paris, Rome, New York (twice) and Washington DC calling for his release, an Alexandria court found him guilty and sentenced him to four years in prison." "Will the emergence of the Internet cause the age of free creative writing to come forth earlier? Will it bring out more independent writers? These phenomena already exist. The good works that I have read all came from the Internet..."
El Oso, El Moreno, and El Abogado » Blog Archive » Who You Calling Soft? "Blogs are there. Podcasts are there. YouTube celebrities are there. Global Voices is there. So what?" "Despite the signs that North Korea's web culture is ready to take off, internet-juche remains a reassuring form of control in the hermit regime." Global Voices Online » Pakistan: Online freedom of speech as collateral damage? "What can you do, as a defender of online free speech, when your country, your fellow citizens–and maybe you –are insulted by those exercising freedom of speech?" " the reaction from the blogosphere in Egypt and throughout the Middle East is a bit more complicated. Kareem’s blog posts have upset many Egyptian bloggers, who were upset with his comments criticizing Islam. " I'm so pleased to learn that Caribbean writer and critic Nicholas Laughlin's number one choice in the Global Voices Valentines Day poetry contest was my favorite as well! Madam, I am 28, single is by our South Asia editor Neha Viswanathan, a very talented and very original writer. Madam, I am 28, single. I am lonely. Are you? on your very public profile. finding your lovely self Madam.